In the past I’ve doubted Barack Obama does 2nd Tier thinking – Obama a 2nd Tier Thinker? – and wondered if maybe Vladimir Putin does – Putin a 2nd Tier Thinker? The latest state of play in world crises seems only to confirm my view of Obama. But then, of course, it might be easier for Putin and Lavrov to seem all masterful and reasonable; it’s not their Russia which is being destabilised by Ukrainians! If Obama, like most of the West’s leaders, seemed to be pretty much bamboozled by Putin’s tactics in Crimea and eastern Ukraine – see: Has Vlad played a Blinder? – he seems to be completely caught out by the ISIS aggression in Iraq over the last month. Like a startled rabbit caught in the headlights, on 13 June he said he would take several days to decide what to do about Iraq. A few days later there was an announcement of upto 275 military and security personnel being sent to Baghdad to help protect the US embassy there and to advise Iraq’s generals. The USS George H W Bush aircraft carrier has been moved into the Gulf and secretary of state John Kerry has been talking up the use of drones. There has even been some talk of cooperating with Iran to undermine the ISIS advance – though the Iranians seem less keen than the Americans, according to the Associated Press. You get the impression of headless chickens running around in the White House. There seems to be no thought-through strategy. Rather, other than a few panicky responses like aircraft carrier movement, there simply seems to be an inertia of strategy. 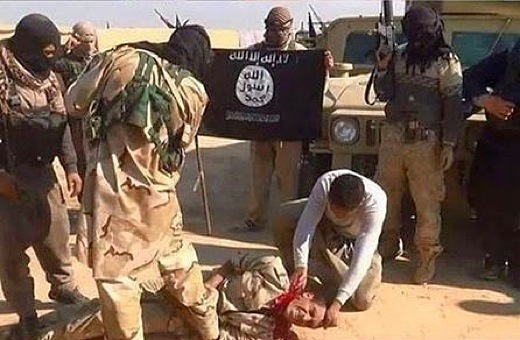 Now ISIS has declared an Islamic caliphate running from Aleppo in northern Syria to Diyala province in eastern Iraq. 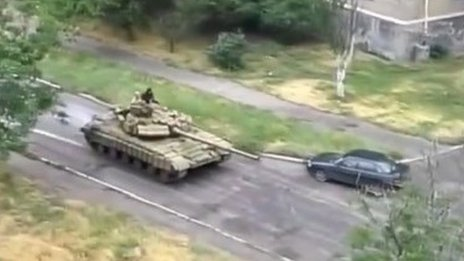 In the meantime, the Russians snuck tanks across the border into eastern Ukraine. How did ISIS become such a threat so quickly? As the revelations of first Julian Assange and then Edward Snowden have made only too clear, the Americans love to spy. They are obsessed with collecting intelligence, on their own citizens and on foreign nationals of interest – just ask Angela Merkel whose private mobile phone was hacked! So how come the White House didn’t know that ISIS were going to advance on Mosul and Takrit and have strategies in place to deal with it? The fact that ISIS had captured Fallujah and Ramadi in January and then hung onto them successfully against weak efforts to dislodge them by the Iraqi army should have put Obama and Kerry on maximum alert. Some in the Pentagon, however, were definitely alarmed. The Sunday Times’ Tony Harden & Tim Shipman report that General Michael T Flynn, head of the US Defence Intelligence Agency, warned Congress in February that ISIS “probably will attempt to take territory in Iraq and Syria to exhibit its strength in 2014”. So it seems likely that Obama was told just what a threat ISIS posed…but did nothing…? Was the man in denial? From his first inauguration, Obama has tried to minimise US involvement in contentious foreign adventures while his GREEN vMEME has pursued his real passion: creating a fairer and more decent society in the United States – perhaps best encapsulated by his dogged pursuit of health care reform. While he made sure he was caught on camera in the operations room, cheering as a marine assassinated Osama Bin Laden on live TV right before his eyes, crusading against Islamist terrorists was never his forte as it was predecessor George W Bush’s. Closing down ‘unwinnable’ overseas wars in Iraq and Afghanistan and getting the troops back was a priority. Where necessary, drones provided a bloodless alternative for taking out Taliban militants – ‘bloodless’ at least for the American voters, if not for the luckless Pakistani villagers who were frequently too close when the drones struck. Its attention all too readily consumed by domestic priorities, time and time again Obama’s White House has been caught out by events on the world stage. The Americans appeared completely foxed by the ‘Arab Spring’ uprisings, mouthing platitudes about supporting democratic movements while still continuing to fund many of the US-friendly despots who ruled in the Middle East. Though it was largely predictable, the Americans seemed surprised every time another Arab state was convulsed. Nor, when the convulsions in some of those states edged into civil war, did the Americans seem to know what to do. When Libya drifted into civil war in 2011, the French knew exactly what to do: French jets were in the skies over Benghazi and struck Muammar Gadhafi’s attacking army with devastating force the instant the French got their authorising resolution through the UN Security Council. By comparison, Obama has dithered over Syria for 3 years. He went against then-secretary of state Hilary Clinton’s advice to arm the moderate rebels, for fear the jihadists would get hold of them. According to a number of commentators such as Jamie Dettmer, it was this lack of real support for the moderate rebels which allowed the Islamist radicals, with their Saudi-funded arms, to fill the void and provide the regime of Bashar al-Assad with some effective opposition. ISIS cut their teeth in Syria fighting both Assad’s forces and other rebel groups and finally winning enough territory to give them a springboard into Iraq. It was also in Syria that ISIS first won their reputation for unflinching RED/BLUE zealotry and unrelenting and merciless brutality in their imposition of absolute Sharia Law. It’s a reputation they have deliberately fostered through explicit and gruesome videos of beheadings and crucifixions posted to YouTube and other social media. In part at least, these videos explain the rout of 30,000 Iraqi soldiers at Mosul by 800 ISIS fighters. The sheer fear of what would happen to them if they were captured was undoubtedly one reason why so many of the impoverished, hungry and disillusioned soldiers stripped off their uniforms and ran. The one stand Obama made over Syria – his infamous ‘red line’ on the use of chemical weapons – ended in tragicomedy – see: Cameron: “I get that!” (Or does he?) . Of all people, it was Vladimir Putin who rescued him from the trap of his own making by getting Assad to cooperate in the voluntary handover of his chemical arsenal. Turning to consider the Russian president, in contrast to Obama’s reticence on the world stage, he appears to know exactly what he wants: Russia to be a global super power, as potent and as respected as in the days of the Soviet Union. It is also said by commentators such as Stephen Wayne Kasica that Putin wants Russia to expand to the borders of the former Soviet Union and to take back all those countries which achieved independence in the 1990s. The latter, of course, is unrealistic and Putin knows it. However, he can use the Russian diaspora – the scattering of sometimes very large numbers of ethnic Russians throughout the former Soviet states – as a means to lever influence on those states. By championing the cause of those ethnic Russians in states where they are often discriminated against and treated as second-class citizens – as they were in Ukraine and still are in the Baltic states – Putin reinforces his bedrock support amongst Russian nationalists while intimidating Russia’s neighbours, even if in an apparently benign way. Doubtless using agent provocateurs to stir up ethnic Russians abroad to demand their rights while hailing him as their champion, like a hunting cat, Putin waits patiently for his opportunities, ready to pounce when they occur. When the opportunity came with the Ukraine, Putin was ready to take Crimea back. The BBC’s John Simpson (2014b) is just one renowned commentator who has written about how meticulous and well-planned the Crimean takeover was, with almost no loss of blood. Whatever the legality of what the Russians did, no one can deny it was a work of genius. Rather less clever has been the decline of eastern Ukraine into virtual low level civil war. We may never know whether Putin had plans to annex parts of the east or whether he simply wanted a fairer deal for eastern Ukraine’s ethnic Russians and to neutralise the Ukraine away from the influence of NATO and the European Union. What he’s got is an almighty and bloody mess – a complete contrast to the Crimean takeover. According to reporters like The Guardian’s Oliver Laughland, Conal Urquhart & Alan Yuhas, the votes in the Crimean referendum in March had hardly been counted before Russian nationalists were streaming across the border into Donetsk and other eastern cities to stir up their sizeable ethnic Russian populations. Whether they were Kremlin-driven or self-driven is unknown at this time. This raises the question of whether, having used the beast of Russian nationalism vis-à-vis the Ukraine to get back the Crimea, Putin is struggling to get the beast back on the leash. Certainly there have been contradictory signals coming out of Russia. Putin first told Merkel at the end of March that he had ordered most of Russia’s 40,000 troops on the border with Ukraine back to barracks. A second assurance to this effect followed in April. It was the end of May before NATO confirmed large-scale troop movements away from the border. Why the delay? Then there is the question of the Russian tanks which appeared across the border in June. Shorn of Russian markings, these were old T-64s, no longer an operational tank for the Russian army; but NATO claims the Russians still have a number in battle-ready condition (Jonathan Marcus, 2014b). 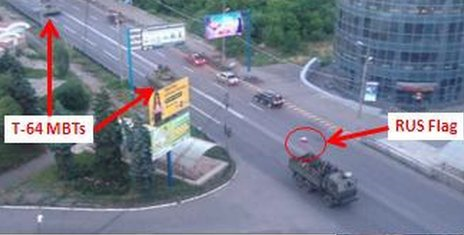 Open source videos showed the tanks in Snizhne and Makiivka, with a lorry flying a Russian flag ahead of 2 T-64s in the latter. The Kremlin claims to know nothing about these tanks; but NATO has satellite images of military convoys including T-64-type tanks just the Russian side of the border the day before a very similar convoy was filmed in Makiivka. So, is Putin lying blatantly or are there ultra-nationalistic elements in the Russian army who were out of his control at times…? We may never know. What we do know is that, with Western sanctions hurting the Russian economy and more sanctions threatened, Putin has been rowing back from the extremist positions taken by the rebels in eastern Ukraine. First, he spoke out against independence referendums in Donetsk and Luhansk; then he recognised Poroshenko as Ukraine’s new president; he encouraged the rebels to join in the ceasefire Poroshenko unilaterally declared; lastly, he has asked the Russian parliament to revoke the authority it only gave him on 1 March to intervene militarily in the Ukraine. Crimea was an unbridled success for Putin but he was always going to be under pressure internationally as to the legality of its annexation. Whether he planned the initial unrest in eastern Ukraine and whether or not, with ultra-nationalist assistance, the rebels have partly slipped from his control, and whether Putin bears responsibility for the violence of the rebels, the current situation can serve him well. If Putin can bring pressure to bear on the rebels to lay down their arms while simultaneously forcing the ‘unreasonable’ Poroshenko to negotiate on rights and semi-autonomy with the rebel leaders, he is again the hero who saved the situation. In the meantime, Crimea is being ‘Russian-ised’ as quickly as possible – with Russians being told it is their patriotic duty to holiday there and subsidies given to some companies to send their employees for a break there, the Sunday Times’ Mark Franchetti reports. Whatever they may say about the illegality of the annexation for media purposes, Western governments will quietly forget about Crimea becoming a de facto part of Russia. For them, it is a small price to pay for the cessation of violence in eastern Ukraine. What seems less certain is that Western leaders will realise that it is their weaning away of Ukraine from Russian influence to the EU which is, in large part, a root cause of the problem. Partly due to their intertwined history going back hundreds of years, partly because it provides a buffer between Russia and the West, and partly because of its importance to the Russian economy, Putin’s ambitions for a resurgent Russia were never going to allow the Ukraine to come easily under Western influence. If the West continues to draw the Ukraine towards it, then Putin is likely to reactivate ethnic Russian unrest in the east. It is something he can do at any time…and he knows it. How much the West fails to recognise this is reflected in the partnership deal the EU signed on 27 June with the Ukraine and 2 other former Soviet states, Moldova and Georgia. It’s almost like Western leaders have a desire to humiliate Putin and Russia. No wonder Putin is so determined to exert Russian influence wherever discriminated-against ethnic Russian communities give him moral licence to intervene. Many commentators in the West have argued that Russia’s ‘aggression’ in Eastern Ukraine is a reversion to cold War thinking…but, from another perspective, it can be argued it is the West which is locked into the BLUE/ORANGE Cold War agenda of trying to minimise Russia’s influence by bringing Moscow’s former satellites under its influence. If the West really wants to see long-term peace in the Ukraine, then the best it can hope for is that the Ukraine becomes economically and politically neutral in the same way Switzerland is. Obama should have known that one person/one (secret) vote Democracy would not work in Iraq. For that matter, so should his predecessor…but many expected more from Obama than they did Bush. Just as PURPLE tribalism underpins the crisis in Ukraine, so it has created sectarian fault lines along which Iraq is now splitting. Western-style Democracy assumes theoretically that voters will be responsible enough to consider the issues and vote on the merits of the ideas the candidates put forward for dealing with those issues. It doesn’t actually work like that, of course. People tend to vote according to party or class alignment. Though there has been some evidence of class de-alignment in the UK – eg: Dennis Kavanagh & David Butler (2005) – a large-scale series of studies by the Pew Research Centre (2014) have found that polarisation by party is at a 25-year peak in the United States. If supposedly-sophisticated nations like the US struggle to escape from neo-tribal politics, what chance do overtly-tribal countries like Iraq have of living up to the ‘democratic ideal’? In a tribal society, you vote as the tribal elders instruct and in the interests of the tribe rather than the super-tribe country. Add in the veneer of BLUE religious dogma and intolerance and you get Shia voting for Shia, Sunni voting for Sunni and Kurd voting for Kurd. Strictly speaking, according to the democratic ideal, prime minister Nouri al-Maliki has been entirely correct in saying that he was democratically elected as leader of the largest party in Iraq and that it is the will of the people that he should be leader. As there are far more Shi’ites in Iraq than there are Sunnis or Kurds, then, of course, the Shias voted their man in to represent their interests – rather than the interests of the country and those ‘others’. By imposing one person/one (secret) vote Democracy on Iraq, the Americans effectively embedded voting along sectarian lines to produce a sectarian government – which is exactly what Maliki has run. If the Americans had used the Gravesian, approach, they would have understood that Western-style Democracy is entirely inappropriate for Iraq at this stage in its development. What was needed was some form of institutionalised power-sharing – perhaps along the lines of Arend Lijphart’s (1977) ‘consociationalism’ concept which has worked so well for government in post-Good Friday Agreement Northern Ireland. This would have forced Shia, Sunni and Kurd politicians to work together. That way a workable form of Stratified Democracy might have come to Iraq. Instead the blind BLUE dogma that the Iraqis must have Western-style one person/one (secret) vote Democracy may actually have worsened the sectarian fault lines in Iraq and so been a major causal factor in the present crisis. Whether a multi-cultural/multi-religious Iraq can survive the present crisis is highly debatable. The Kurds appear determined to hold an independence referendum while the Iraqi army vs ISIS is all too easily caricatured as Shia vs Sunni – especially now Iranian jets are reported to be flying for the Iraqis (Jonathan Marcus, 2014c). Of course, the Saudis, long held to be funders of Sunni radicals, are now so concerned by the threat of ISIS that they have put 30,000 soldiers on the border with Iraq, reports the Daily Mail’s John Hall. (The RED/BLUE fundamentalist zealotry of ISIS would have little patience with the extravagant wealth and wastefulness of the al-Saud royals if they ever got to Riyadh!) So it is theoretically possible that the Saudis might come to some kind of agreement with the Iranians to form a united Shia-Sunni front against ISIS. Unfortunately, what is more likely is that the Kurds break away and Iraq becomes a ‘failed state’ to the depth that Somalia was. Geo-political rivalry is likely to keep the Iranians and the Saudis competing for influence over an Iraq that is a patchwork of Government Shia, non-government Shia, ISIS and non-ISIS Sunni skirmishing interminably. If Wednesday’s gun battle between Government soldiers and the followers of the radical Shia cleric Mahmoud al-Sarkhi, in which 45 people were killed, is anything to go by, local ‘warlords’ are on the rise again, potentially hastening Iraq’s slide into complete chaos. In that scenario, the ruthless determination of ISIS is likely to keep them growing in both Iraq and Syria and consolidating their caliphate. In that scenario ISIS may well be able to live up to its perceived threat, as outlined by the Quilliam Foundation’s Charlie Cooper, of exporting jihadist terror to the West. In which case, Obama may well rue all that dithering. Leave Gerry Adams alone! Hope from the Tragedy of MH17…? Jon, have you come across the work of John Bunzl and SIMPOL? http://uk.simpol.org/index.php?id=50 He’s got some really interesting ideas on world governance. In essence it’s getting countries to cooperate on key issues, based on common self-interest – eg: tackling climate change before climate change changes the world irrevocably. In Bunzl’s concept, areas not requiring work at a global level are left to individual countries or regional groupings. His ideas should fit in with Stratified Democracy -http://www.integratedsociopsychology.net/stratified_democracy-modernisation_theory5.html#StratifiedDemocracy – since no country has to change the way it is governed to participate. Theoretically, multiple simultaneous enactment of global policies should prevent any one country being disadvantaged. Personally, I don’t think my TURQUOISE is developed enough to get my head around how SIMPOL would work in practice – just can’t see how the 1% could life their snouts from the trough long enough to consider it or ISIS stop beheading apostates and unbelievers long enough to join in…. But Bunzl’s ideas are impressive theoretically and SIMPOL is certainly one to watch! Hi Keith, yes, I know about SIMPOL. It is a very nice idea – it is a way for people to register that they want to make a difference on an issue regardless of party or country, So, for some issues I suppose it might work well. I just took a look at the web site and it looks as though a good majority of the MP’s signed up are Liberal Democrats. That doesn’t surprise me – I would think they would be most willing to work cross party for a bigger picture. In practise, I think that when the world is ready for simultaneous action it will happen anyway. So, for me SIMPOL is a call to the future and when the time is close it will be redundant. So, it is a great way to draw attention to the need to work together but I don’t think it will be a major facto in it actually happening. At least, not from within politics anyway. I think the best prospects for anything interesting happening is natural progress through everyday stuff like crises, cooperation and such like across the board and, more specifically, action to connect and organise second tier generally. For the second of those, we need mass scanning and connection. Where is the world going ? Do we think that in the end, one of the various competing powers in the world will come to dominate? There are a number of possible answers to that question. scaled back, somewhat or completely. c) No, agreements are made such that more than one large world power continue to co-exist in relative calm. d) No, the world is instead united into one global power. leaders and factions come to the fore in various countries. chaotic places like Iraq and North Korea and not easy places to control. Muslims that really wouldn’t want to give up on the luxuries a modern western society brings. outcome of that is inevitable – misery for those involved and no long term answer to the global question. willing to do that we would be seeing quite so much unrest in the world at the moment. leaves c). We have to get on with each other. It is time to talk. the end it has to go one of two ways, war or cooperation. but because practically it is the only sensible option. If world government, and universal world peace, is not on the agenda right now then what is there to talk about? Well, just how are the worlds major powers going to ensure their short to medium term survival so that they can continue to prosper and evolve. Diplomacy and agreements. On as many fronts as possible while respecting individual powers rights to self rule within their own borders. So, We need world agreements on political, social, trade, borders, education, law, world security, the environment and all the things that will ensure our mutual long term survial. And, in the end, there is bound to be individual and social evolution to who knows where. There is no going back now, except very badly.